Finding a good horror film has been a little like a prompt train over the last few years, they are few and far between. However, 2013 has produced more than its fair share of movies within the genre, with the excellent The Purge, released earlier this year; Insidious 2, which is in cinemas this autumn and of course, the subject of this review; You’re Next. But can this modern horror film deliver the thrills and spills of those of yesteryear? Relative newcomer Adam Wingard directs this rather formulaic home invasion film with some nice creative touches and a rousing score, borrowing heavily from other similar films like the dire When a Stranger Calls, the excellent The Strangers and the downright ridiculous Black Christmas. However, what sets You’re Next apart from the pack is in its comic timing. Rather than going for full shock value, the film delivers a comedic edge which is welcome in breaking up the bludgeoning and stabbing, which there is a huge amount of. The plot is simple, a family gathers at their parents’ large manor house to celebrate an anniversary, only to be taunted and butchered by a group of masked killers intent on ruining the party. There are the usual horror clichés of people being watched from outside, people being crept up on from behind and the gem that is thinking there is someone there and realising it’s just a member of the family, but Wingard keeps it feeling fresh and new throughout. The acting is generally terrible, as is the case with many horror films, but because the movie never takes itself too seriously, the performances add to the overall effect rather than become an annoyance. One stand-out characterisation is Sharni Vinson as Erin, a larger than life Australian who really comes into her own in the battle between the ever decreasing family and the constant onslaught of the masked murderers. Whilst not scaling the heights of last year’s Cabin in the Woods, You’re Next really helps show that there is life in a genre which has been inundated with cheap knock-offs, countless sequels and pointless remakes. It is daft, unoriginal and full of lifeless characters, but as a slice of truly terrifying horror and a piece of laugh out loud dark comedy, it succeeds and is highly recommended. OVERALL: 36/60 A delightfully funny horror, just don’t expect anything too original. 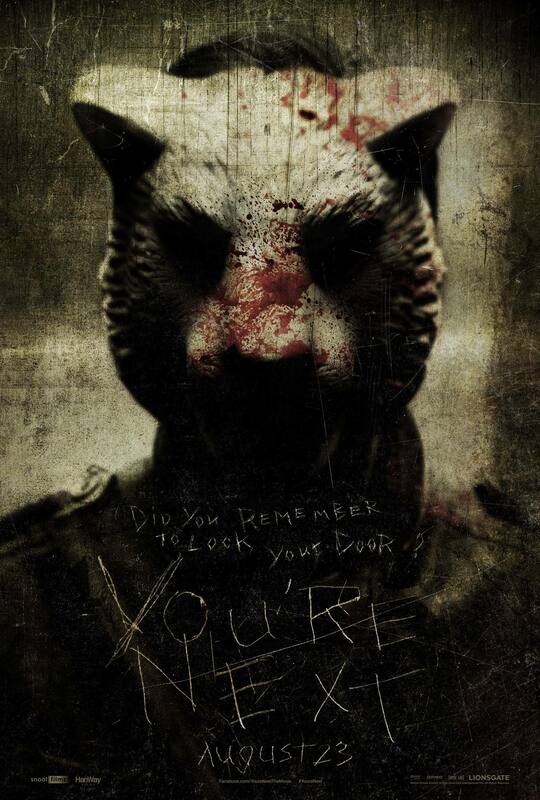 ← You’re Next: Coming Soon!